Voter turnout in primary one of the highest for midterms in Wyandotte County memory – Welcome to Wyandotte Daily! The Wyandotte County Board of Canvassers met today to certify election results. No election outcomes changed. Election Commissioner Bruce Newby said turnout was the highest he could remember for a midterm primary election. Voter turnout in the primary election came in at 25.29 percent, the highest voter turnout in a midterm primary election here that Election Commissioner Bruce Newby can remember. He attributed the higher turnout to voter interest in the contested races on the ballot this year, including the Democratic ballot’s governor contest, 3rd District House contest and the local race for judge, as well as to the Republican ballot’s governor contest. Earlier estimates for voter turnout were 15 to 18 percent here. Newby said his records only go back to 1996, and it’s possible that the Aug. 7 turnout was higher than some of the midterms before then, as well. While 25 percent is a good turnout for a midterm primary, the other 75 percent of the registered voters who didn’t vote causes him concern, Newby said. “When people don’t vote, it ceases to be a government of the people,” he said. Those who don’t vote are letting one out of every four registered voters decide for them, he added. Newby said with the amount of interest in the governor’s contest and other contests, the general election could see a 45 to 50 percent turnout, although that could be ambitious. “Historically, it’s been under 40 percent,” Newby said. The governor’s contest is shaping up to be a three-way race among Kris Kobach for the Republicans, Laura Kelly for the Democrats and Greg Orman, an independent. Orman’s petition has been verified in Wyandotte County, he said. Petitions with more than 10,000 signatures have been submitted in Topeka, and are awaiting approval at the state level, he said. Election results were certified as official this morning by the Board of Canvassers meeting at the election office at 850 State Ave., Kansas City, Kansas. No election outcomes changed here. The canvass meeting today lacked the drama that was seen on Monday in Johnson County and Sedgwick County, where the numbers of provisional votes were in the thousands and results affected a very close Republican governor’s race between incumbent Gov. Jeff Colyer and challenger Kris Kobach. After those results came in from provisional ballots in Johnson and Sedgwick counties, Colyer conceded the race on Tuesday evening. In Wyandotte County, Kobach received 30 more votes today while Colyer picked up 18 more. Newby said that Colyer knew on Tuesday there were not enough votes left to count in Wyandotte County and other counties that would change the outcome of the election. The official total in Wyandotte County was 2,824 for Kobach and 1,598 for Colyer. While Wyandotte County had over 400 provisional ballots considered today, a little over 260 votes were added to the official total here. A little over 160 provisional ballots were not counted. Newby went over the categories of provisional ballots, explaining the circumstances to the Board of Canvassers, which today included five Unified Government commissioners, as well as others. For the most part, some of those who voted provisional ballots seemed a bit confused, going to the wrong polling place or voting at the wrong precinct after changing their address, and those ballots were counted. But state representative votes were eliminated if the voter cast a ballot for the wrong district. Six people were couples in households who signed each other’s mail ballot envelope by mistake, and the Board of Canvassers agreed to count those votes today. One 68-year-old person voted twice, once by mail and once in person at the polling place, the election commissioner said, and one ballot was not counted. The only item where the Board of Canvassers reversed the election commissioner’s recommendation was where two voters voted a question-only ballot, then they decided they also wanted to vote a party ballot. The election commissioner had recommended only counting the question-only ballot because that is the first ballot the voters requested. However, the Board of Canvassers decided to count the votes on the other ballot as well, but only counting one sales tax vote per person. The largest category of votes that were denied, 66 votes in all, was from voters who were not registered to vote. 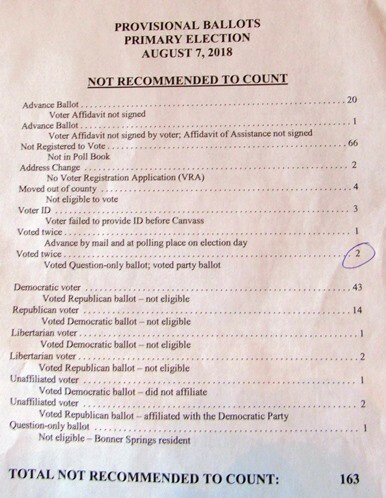 Twenty ballots were not counted because the voters did not sign the affidavit. Also not counted were 43 Democratic voters who tried to vote a Republican ballot, 14 Republicans who tried to vote a Democratic ballot, one Libertarian who tried to vote a Democratic ballot, and two Libertarians who tried to vote a Republican ballot. Members of parties who want to vote in the other party’s primary must change their party affiliation by June 1, according to the state law. In addition, one unaffiliated voter who voted a Democratic ballot was not counted because the voter did not affiliate with a party, and two unaffiliated ballots were not counted because they voted a Republican ballot but had affiliated with the Democratic Party. The unaffiliated voters are allowed by law to declare a party at the time of the primary, and vote in that party’s election. There also was one ballot that was not counted because a Bonner Springs resident voted a sales tax-question only ballot for Kansas City, Kansas. Three voters failed to provide identification before the voter canvass, and their ballots were not counted. The election office contacts those voters to give them the chance to bring their ID to the election office before the day of the canvass. Poll workers may have made a mistake on two ballots with the sales tax question, where the voter was at the correct precinct, but was asked to vote a provisional ballot, according to Newby. Those two votes were counted today. Commissioner Jim Walters asked Newby why voters couldn’t vote at any precinct, instead of just at one precinct, on election day. Newby said there would have to be a change in laws to allow that. In advance voting, only touch screens are used at three voting locations. The touch screen machines will show if a voter has already checked in at another polling place, and they will be able to provide the specific ballot for that voter. It would be very expensive to provide paper ballots at each precinct for every different state representative or other board’s district in the county, according to Newby. Newby said in answer to a question from Commissioner Tom Burroughs that it was more difficult this year to find polling places. Argentine Recreation Center had other commitments, and the election office had to scramble to find another place that was ADA accessible. Schools are concerned about the safety of children on election day, and if election day were to become a school holiday, perhaps they might be able to use some school buildings for voting, Newby said. The election office is paying a fee to use buildings for voting, he said, and one price that was sought for one building’s use was $500. The election office formerly used a Kansas Speedway building for advance voting, but they were told that the building now is being used for other events including Speedway events and American Royal barbecue events, and it is not available any more, he said. The official vote totals for the three-eighths-cent sales tax question in Kansas City, Kansas, were 10,710 yes to 6,909 no, for 60.79 percent approval. The official vote totals for the Democratic nomination for U.S. Representative, 3rd District, in Wyandotte County were Brent Welder, 7,641, Sharice Davids, 4,384, Tom Niermann, 1,027, Sylvia D. Williams, 592, Mike McCamon, 494, and Jay Sidie, 314. Davids won the district-wide nomination, when votes were added from Johnson and Miami counties. Official vote totals for the Wyandotte County District Court judge, Division 5, contest were Tony Martinez, 5,366, Jane Sieve Wilson, 4,789, and Mike Nichols, 3,565. Provisional votes that were recommended not to count in Wyandotte County.